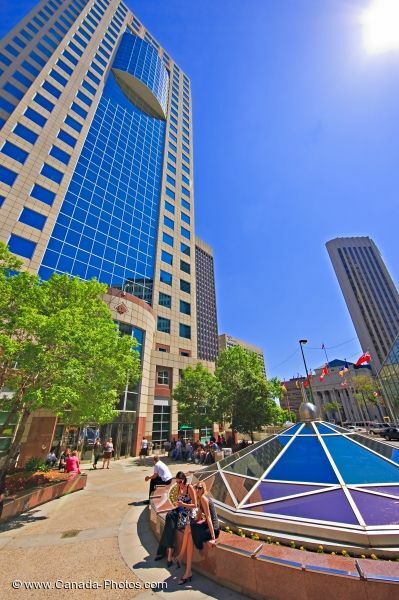 A sunny day in the City of Winnipeg, people enjoy an outing by the Canwest Place building. Using modern architecture, the Canwest Place building has straight lines and tinted glass. This angle the Canwest Place building dominates the scenery. A glass dome sits in the foreground with colors of purples and blues. People enjoy the day out in the City of Winnipeg. Canwest Place building in the City of Winnipeg, Manitoba, Canada. People enjoy the sunny day along the walkway of the Canwest Place Building.